You'll have to define 'avatar'. Male mesh bodies can have women's apparel made for it, and I think I have seen some - but haven't really paid much attention to it. Another option is to use a female mesh body with a flat chest add on, and clothes rigged for that. Another way is to wear un-rigged clothing and fit it manually. As for makeup, yeah; as long as the applier is compatible with the brand of head, or has an Omega applier and you have an Omega relay for your head, you can apply 'female' makeup on a male head. Once we know the answer to that question we'll be better able to help you find the look that you're seeking. And what is your budget. Mesh bodies and heads are expensive, if you will make special looks. You can find free heads, but they cant use lipsticks, et cetera. A freebie avatar like you ask for is possible, but I don't post more before I know if you will buy something or not. 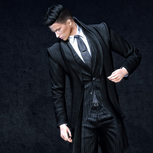 Unfortunately, the "masculine man wearing makeup and skirts" is one of the most difficult to achieve in Second Life, since it's a very niche form of expression. There are a few stores that will cater to your needs, but they mostly rig their clothing for one of two male mesh bodies: Belleza Jake (more commonly) or Signature Gianni (less commonly). 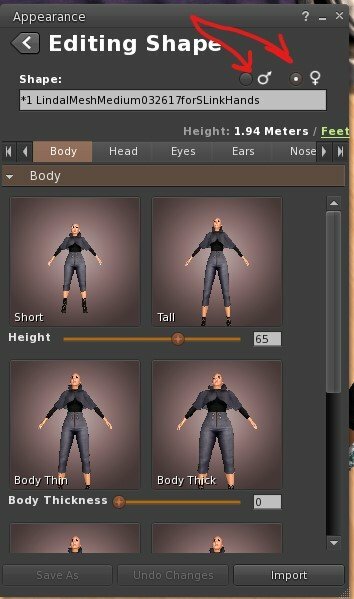 This mean you can't wear that specific clothing with the basic system avatar, as it's created to work with an additional mesh body purchase. The more common version that is better catered for is for men to wear the female Maitreya 'Lara' mesh body, together with the Valentine Technologies (V-Tech) 'Boi' flat chest mod, which removes the breasts on the Lara body. Together with a female bento mesh head, and a lot of shape customisation, it's possible to achieve a (less-masculine, admittedly) male look that way. Most guys who opt for this go the prettier 'femboi' route, but some of us who work it go darker and more punky. It's an option, anyway. As to makeup: if you have a system avatar head (ie: you've not purchased a specific mesh head) then you need to look for tattoo layer makeup. If you have (or decide to buy) a mesh head, you will need appliers created for that head (eg: Catwa lipstick applier for a Catwa head). There are many men, like me, who wear some traditionally-female items on male mesh bodies. Skell almost always wears some kind of makeup and often wears heels, but I don't put him into overtly feminine clothing, as that's not his style. I can give you a few visual examples if you'd like to see them, but the above is all I can really help you with if your wish is for a more "masculine man wearing skirts and lipstick" kind of look. Addendum: If you're looking more for a 'sissy' look then there are Adult groups in SL who cater to that need. You may find better advice and clothing ideas by asking around in those. Maitreya body with flat chest add-on is still looking like a feminine man, or androgynous. Still no reply if he will spend money on it or not. Second Life advertise it is "free to play" but that is with the basic avatar, not with user-created mesh bodies. The default or classic male starter avatar in its male skin with free makeup layers - not appliers - and free clothes that uses layers plus prims, is the only way to get this look for free. If you don't insist on having a mesh body and head, it's really pretty simple. If you right click your avatar and select Edit Shape, you'll see a window full of sliders that control your face and body proportions. At the top of the window is a pair of radio buttons to choose Male or Female. Choose Male. Edit your shape as needed for the amount of masculine appearance you want. Wear a female skin, but a masculine hairstyle. You'll probably need to do a lot of clothes shopping though. Mesh clothing has its own shape, regardless of your body's shape. You may want to look specifically for clothing offered as "fitted mesh" or "fitmesh", or shop the freebie stores for older style "system layer" clothing, which does conform closely to the body shape. And do demo lots of mesh heads some female heads can be tweaked to get a more stereotypically male-gendered look just using the sliders. Square jaw thin lips blocky head maybe to start and go from there. Try some out. Find a look you like then keep playing until you have 500 more!